Odium was a terrifying, exciting ride through a land of zombies. A land that is not rotten and black, as the self-proclaimed leaders behind the walls of the barricaded cities would have you believe, but alive and flourishing. Except for the dead that bring their rotten stench with them. One of the many things I loved about this novel was how Claire C. Riley used the sense of smell, which is usually overlooked in zombie novels, to bring another level to the dead she created in this world. I felt like I was in her world from the start. I clearly saw the rot and distinctly smelled the putrid decay. I desperately fought to stay alive. Odium’s characters were alive and credible. The characters’ decisions were believable, even if they weren’t always reasonable or practical. But that’s what made them genuine. And the humor injected between the nail-biting moments, was spot-on. 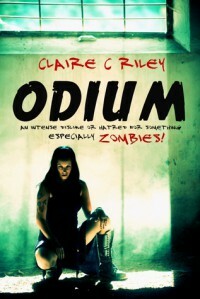 Odium is not a run-of-the-mill zombie story. It is so much more, and Claire C. Riley is an amazing writer. I mean, who else would describe the moan of a hungry zombie to a throaty groan that would escape you during a sensual back massage? Kudos, Claire. So, if you like zombies, then make sure this one gets on your list.